Zoo to Taronga Western Plains Zoo in Dubbo. REGISTRATION FOR THIS EVENT ARE OPEN. of Australia's Pro Tour riders (both male and female) enjoy when they are back home in the ACT. Riders make their way through open rolling country roads with the breath-taking Brindabella Ranges as the backdrop scenery. Interstate riders always comment on how quickly this ride leaves the cities outskirts and heads into country roads, and tranquil surroundings. Yass is the first stop for the day where riders refuel and regroup (11am and 81kms covered). From there riders make a short dash (approx 5km) up the Federal Highway before taking the turn off to Binalong and once again enjoying 98km of winding country roads, great ascents and descents before calling it a day at the Cherry capital of Young, where Day 1 ends with a relaxing Ale at the Federation Motor Inn (arrival around 4.30pm). After enjoying the country atmosphere in Young, riders head out and onto Cowra. After a short climb out of Young, riders can enjoy a relatively flat stage into the majestic town of Cowra, which is best known for the largest Prisoner of War breakout in modern military history (10am and 67km covered). Departing Cowra the riders make the 44km journey along open country roads into Canowindra for lunch at the Trading Post. From Canowindra the riders can enjoy 35km of long gentle climbs and a few descents before stopping at Cudal to refuel and embarking on the 27km ride into the picturesque country side known as Molong, where riders are cheered into the local cricket ground around 4pm. Riders are allocated their rooms, before hitting a well deserved shower. 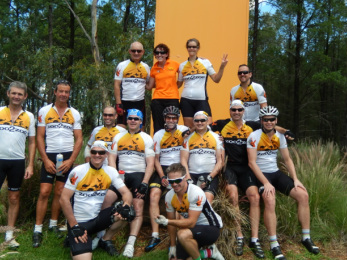 As with Sydney to Dubbo ride, the stay in Molong is the main-event for this ride, where the riders enjoy a great country feed, and time to sit, relax and discuss the many hills they have conquered on the past two days. The highlight of the night is the ‘Kangaroo Court’ where riders and support crew get to have some fun and hand out jovial $2 fines (e.g. the most of number of punctures for a rider or group, brightest Knicks, shoes etc). The idea of the Kangaroo Court is to have some fun after a long 2 days of riding and to raise some extra donations for BDI (payment of fines is voluntary). We say goodbye to the lovely town of Molong with a 7am departure and a nice 23km ride along the rolling hills into Cumnock for breakfast. On a good day you can smell the bacon and eggs being BBQ’d a few kilometres outside Cumnock. This enticing scent has seen some individuals within a group launch an attack (like a breakaway in the final kms of a stage of the Tour de France) on the run into Cumnock, so they can claim line honors in the breakfast queue. refuel at Wambangalang Educational Environmental Centre for the final stretch into Dubbo. The final 30km stretch sees the all the riders come together as one peleton for the roll into the Taronga Western Plain Zoo, where family, friends and the local community cheer all the riders for their great achievement. Entrants must wear an official Zoo2Zoo riding shirt to participate in the Zoo2Zoo. 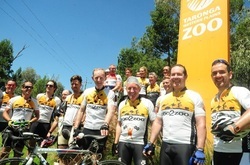 If you have done a previous Zoo2Zoo, you are able to wear the riding shirt from that ride. Otherwise, you are able to purchase a jersey for $100. The cycling kit will be available for collection on the morning of the ride at the start of the Zoo2Zoo. A support vehicle will follow each group of 20 riders and will specifically support those riders.